Is this the 2016 Motorola Moto X flagship? Last week we got a sniff at a potential incoming device from Motorola, with the so-called 'Moto X3' having been spotted en route to India via the Zauba tracking website. Now, a snap of an unspecified Motorola smartphone has been leaked online, which may provide us with our first proper look at what the Lenovo-owned firm has in store for 2016. The aforementioned Zauba info gave little away about the X3 besides its 5-inch display and the fact that it's a single-SIM GSM handset; not the most riveting of feature run-downs. But pictures are much more exciting than mere words, and hellomotoHK has shared an image that may or may not relate to the smartphone referenced a week back. The device looks to have been snapped on a train, unbeknownst to the apparent owner. At a guess, we'd say the display is of at least five inches, though it's pretty hard to tell for definite. There looks to be a fingerprint sensor below the display, a feature that a Lenovo executive already confirmed would make its way to the higher-end Moto devices this year. The port at the bottom, meanwhile, looks to be of the USB Type-C variety. 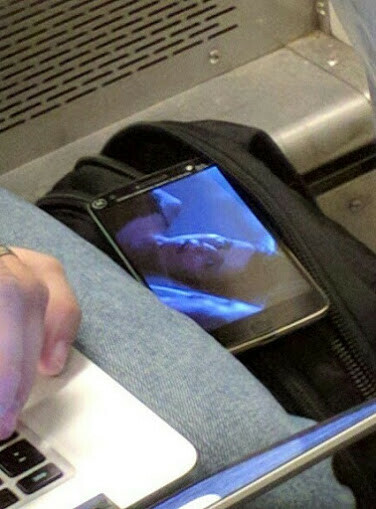 What is on the screen of the device, what is this person watching? He's like "I see you"
I think that's johnny Depp. Probably nightmare at elm street. But I'm not entirely sure. Is that a round front home button? I'm pretty sure that is a fingerprint sensor. Moto x force + 820 + FP scanner + ois. Throw in Project Fi support and I'll get one day one.... then again, I think that's more up to Google than Motorola/Lenovo. Looks like a Meizu Motorola device. With a ROUND home button I see? Looks like another front speaker falls victim to the fingerprint scanner. I hope not, looks like 6-inch big. Heard they were going with Lenovo branding with this one?